The thunderstorms on Thursday did not dampen the spirit of those who attended the historic Hibernia Park Tour. 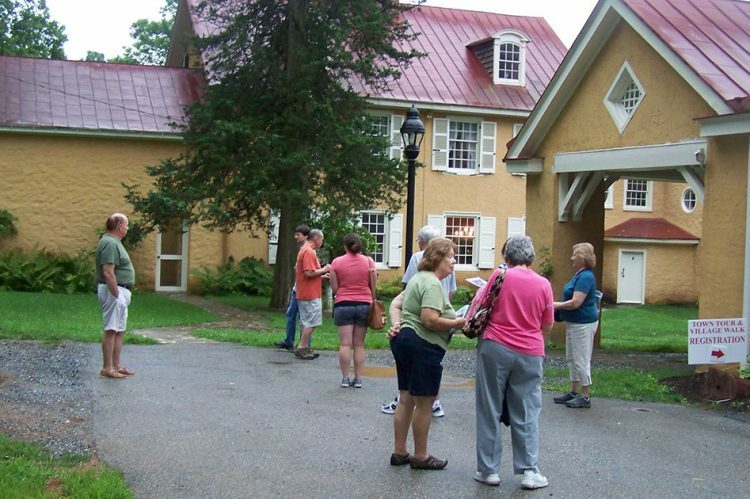 A guided tour of the furnished mansion and self-guided walking tour of the ironworks site featured the property’s transformation from a modest Quaker weaver’s shop and farm, to a thriving 19th century iron plantation, and then a 20th century country manor, to its present-day use as a County Park and interpretive site. The mansion was built in several phases, beginning c.1767, followed by phases in c.1821-64 and c.1895-1905. Dressed in period garb, enthusiastic volunteers guided visitors through the mansion. The mansion was also the site of an earlier c.1700s log structure. Volunteers were also on-hand to answer questions about the ironworks during the visitor’s walking tour on the Forge Trail. Many thanks to our hosts, Friends of Hibernia Park and Chester County facilities and Parks Dept. for their wonderful commitment to preserving and interpreting this site! For those who missed out on this tour, self-guided walking tour brochures are available in the Park office, and the mansion is open for tours on Sundays from 1-4pm. Call 610-383-3812 for more information.